The associated dialog described below will open. Click the OK button to apply changes. 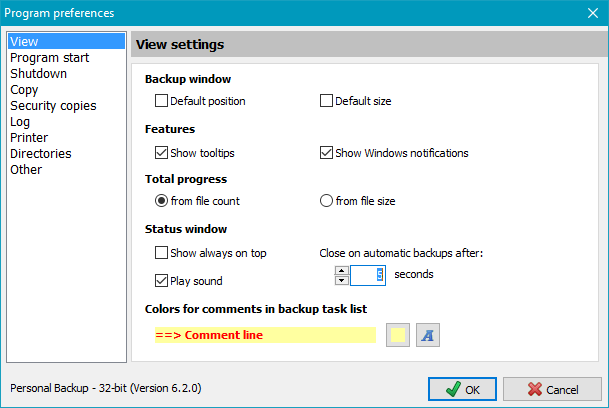 You can select whether the progress bars and the status window at the end of a backup shall be displayed on top of all other windows on screen or not. 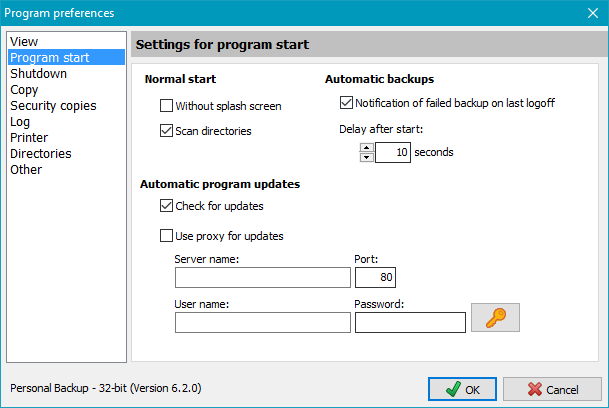 After an automatic backup, the status window is displayed for a short time. The period until this window automatically closes can be set here. The end of a backup is signaled to the user by playing a sound. There are different sounds for a successful backup and for errors and warnings. Optionally these signals can be disabled, which also affects the sounds played when the program icon is added to the Windows notification area, for example after an automatic start of the program. Notification of failed backup on last logoff - If this option is selected and an automatic backup on logoff or shutdown failed, you will be notified of this issue on next starting the program. Check the log for further information as to the reason for the failure. Delay after start - The period the program waits on automatic start (see automatic backup) can be adjusted between 5 s and 5 min (default = 10 s). If there is an automatic backup to be performed on logon, this will start after the chosen delay. On starting the program a connection to the Internet will be established every 14 days to check whether a program update is available (default: enabled). A proxy server can be configured for program updates. If this is required, you must specify server name, port, user name and password. 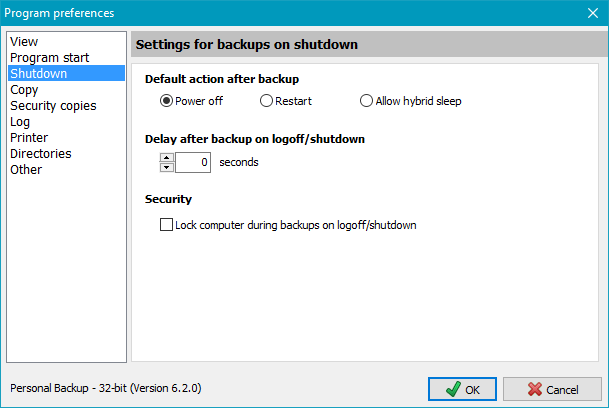 Because it is not possible for the program to recognize the action selected by the user via Windows Start menu (Shutdown or Restart) that will interrupt the shutdown process (in this case for the backup), you can specify the action to be performed after an automatic backup here. Power off - After backup, the computer will be switched off (default). Restart - After backup, the computer will be restarted. Allow hybrid sleep - After backup, the computer will not be switched off, but goes into a mode which combines hibernation and sleep. This will result in a faster boot sequence on restart (available since Windows Vista). Specify the time the program waits after automatic backups before continuing with logoff or shutdown. Lock computer during backups on logoff/shutdown - To preclude access by unauthorized persons during backups started on shutdown or logoff, the computer will be locked. No compression - All files will be copied 1:1 without any compression. Compress as zip - An individual zip file will be created at the destination location for each file to be backed up. During this, all file types listed below will not be compressed within the zip file, but all others will be compressed. Compress as gz - All file types listed below will just be copied 1:1, but all others will be compressed in gz format. File types are characterized in Windows by a filename extension that indicating the file format, e.g. docx being a Word document. File types that are already compressed, such as those with .zip extension or the OpenOffice .odt extension, should not be compressed again but instead just copied. This list can be edited by the user and will be used automatically for each new task, but existing tasks must be adjusted manually. Add - The user can add to the list a file type not to be compressed. Change - The user can select a file type in the list and change it. Remove - The user can select a file type to remove it from the list. If this list of default file types changes with a new version of the program, any types not present in the user list will be (re)inserted automatically. The program uses an internal buffer when copying or compressing files. The size of this buffer is adjustable in multiples of 1 KiB (= 1024 Byte). The default values for new tasks are 4096 kB for Windows operations and 256 KiB for FTP transfers. 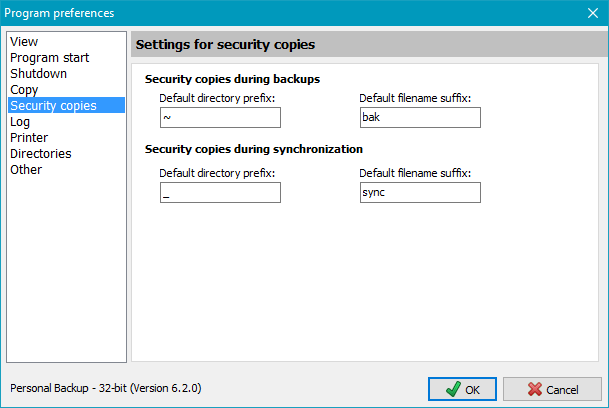 Depending on the backup destination, you can change these values for each backup task individually to optimize the copy speed. The default values are a good compromise. In the options of a backup task you can determine that during backup older file versions will not be overwritten and during synchronization files no longer existing at the source will not be deleted. Instead, they will be renamed or moved to special subdirectories using adjustable identifiers. The presettings of these identifiers valid for all new backup tasks can be adjusted by the user to suit individual requirements. Default directory prefix: - Prefix for the subdirectory to which older file versions will be optionally moved during backup (default: ~). Default filename suffix: - Suffix for the filenames to which older file versions will be optionally renamed during backup (default: bak). Default directory prefix: - Prefix for the subdirectory to which older file versions will be optionally moved during synchronization (default: _). Default filename suffix: - Suffix for the filenames to which older file versions will be optionally renamed during synchronization (default: sync). 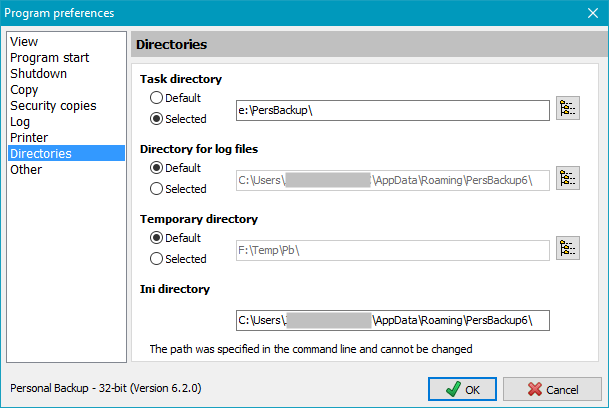 The following settings are the default values for the logs of all newly-created tasks (Backup, Restore, Verification and Cleanup). If desired, you can this adjust individually for each task. This will define the contents of the log file. If everything goes well, a short or long log is adequate. To permit an analysis of errors you can switch to the verbose mode that will give more detailed error messages. Additional information for copied files: A succeeding A indicates that the attribute of the source file was reset (e.g. during incremental backups), a succeeding U indicates that an older file version was overwritten at the destination. Warnings are generated when the backup copy succeeded but changing the attributes and/or timestamp failed at destination. In contrast to the long log, these will usually not be shown in the short log. If you wish to have these warnings also in the short log, select this option. If this option is selected, an automatic printout of the log file will be made to the selected printer after each backup. If this option is selected, the log settings as defined above will be used as default when opening the Restore dialog. For saved Restore tasks the log settings can be adjusted individually. If this option is selected, the log settings as defined above will be used as default when opening the Cleanup dialog. For saved Cleanup tasks the log settings can be adjusted individually. If this option is selected, the log settings as defined above will be used as default when opening the Verify dialog. For saved Verify tasks the log settings can be adjusted individually. If a mail is sent following a backup, restore, cleanup or verification action, the log created can also be sent as an attachment. The name of the attached file is assembled from a prefix (default: PB) and the date and time the action was started. The user can change the prefix for better recognition of mails from different sources. As new logs are added to existing entries, the log files will grow ever larger. The size of these files can be limited under Log settings (see screenshot). 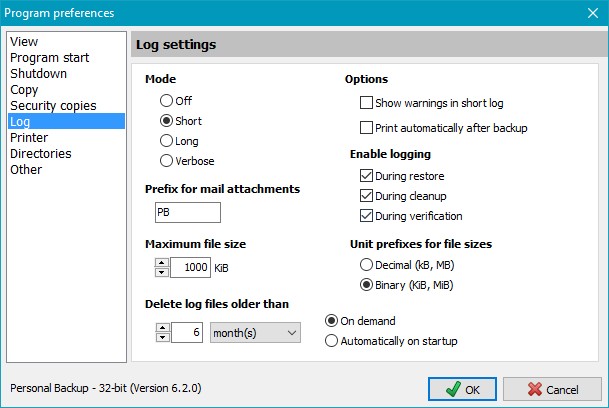 This setting will define a maximum size for a log file. On exceeding this size, the program will rename the current log incorporating the current date (PersBackup yyyy-mm-dd.log). Subsequently logs will be placed into a new, initially empty, log file. The recommendations of IEEE 1541 differentiates between binary and decimal prefixes (e.g. 1 kB, 2 KiB, 2.5 MiB, 1.8 GB). You can select which prefix is to used for indication of file sizes in the log file (and anywhere else in the program). Examples: 1 kB = 1000 bytes, 1KiB = 1024 bytes, 16 MB = 16 000 000 bytes, 16 MiB = 16*1024*1024 bytes = 16 777 216 bytes. As the number of log files grows over time, you can specify an age after which log files should be deleted. The age is entered as a time span of days, weeks, months or years relative to the current date. The deletion of older log files can be done manually or automatically on each program start. Settings for a printer are only needed if log files are to be printed. After clicking the arrow on the right in the drop-down box you can select the printer to be used for printing the log. After clicking the button on the right you can select font name, size and style. 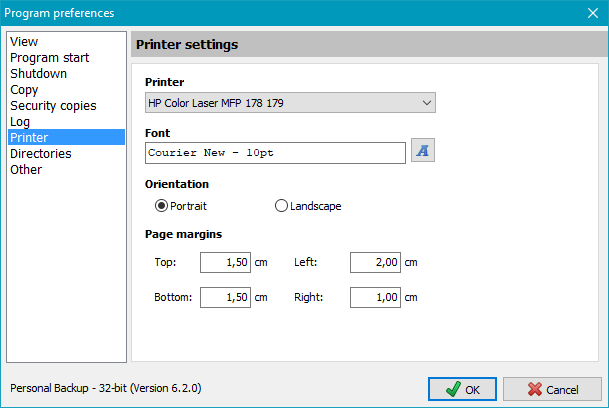 Select the orientation of printout: portrait or landscape. Adjust the margins of the printout. This is the directory where the tasks for backups, restores, verifications and cleanups are to be stored. This is the directory where all log files created by the program are to be stored. This is the directory used by the program for temporary storage of files during backup and other actions. Usually all these files will be deleted by the program automatically after use. This is the location of the file PersBackup.ini where all the basic settings of the program and time schedules of the automatic tasks are stored. If this option is selected, an entry will be created in the Windows Registry pointing to this directory. On resetting to the default directory this Registry entry will be deleted automatically. The settings of this task will be used if a one-click backup is started from the context menu of a directory (see more). After opening the context menu by right-clicking a folder (e.g. in Windows Explorer), select the option Backup this folder using Personal Backup .. to start Personal Backup and to back up all files from this directory and its subdirectories into the destination directory specified in the default backup task. All other settings (backup mode, compression, encryption, etc.) will also be taken from this task. The selection criteria for subdirectories, files and file types are taken from the first directory to be saved. Select the backup task by clicking the button on the right. This option will insert or remove an entry in the folder context menu of the current user. If this option is selected, the user can call a one-click backup of a directory (see above). This feature is only available if the option to insert such an entry for all users was not selected during installation of the program . 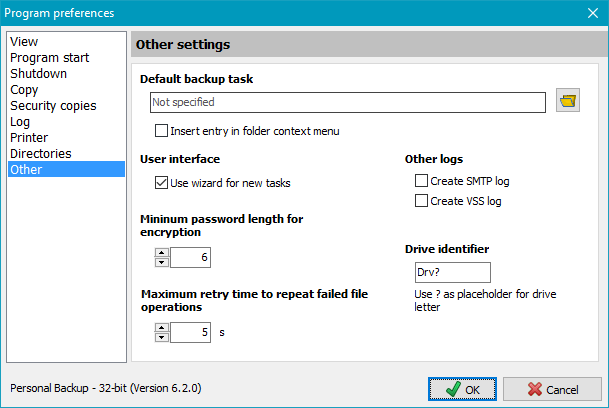 Use wizard for new tasks - If this option is enabled, the wizard will always be started to create a new backup task. Experienced users can disable this option so that they can always freely configure the new task at will. During mail delivery, the communication log is written to the file PbSmtp.log in the log directory (see above). During creation of a volume shadow copy, a log is written to the file PbVss.log in the log directory (see above). Specify the minimum length of passwords for encrypted backups. The user can adjust the time for which the program will try to repeat a failed file operation, like renaming or setting the timestamp. The user can specify the name of the subdirectory the program will use to substitute a source drive in the destination directory on backup (see here). The default setting for this identifier is Drv? where the question mark will be replaced by the program with the current drive letter during backup. The user can specify any other name as identifier, e.g. Drive?, but it is important that the ? remains as part of the identifier!